The next time our leaders plan to discuss important issues that affect all of humankind… maybe they should meet in the garden. Throughout the ages, its virtues have proven to be common ground that everyone can agree on. So, what is the common denominator that brings us to the garden? I believe that connecting with the earth in direct and meaningful ways helps us to connect with what is best within ourselves, making us healthier people overall. Throughout time, gardens and parks have not only served to nourish and heal our bodies, but also to feed our minds through the study of the natural world, and replenish our spirits with its beauty. Forest gardening is the world’s oldest form of food-based plant production. Although this is not a term that is widely used in modern horticultural circles, the early humans responsible for the development of forest gardens may have been more sensible than we give them credit for. During pre historical times, forest gardens first emerged along tropical riverbanks and in the foothills where monsoon rains drenched the earth at regular intervals. Families transitioned from a hunter-gatherer existence and began to improve their immediate environment by identifying and protecting useful fruit and nut trees, herbs, vines and perennial vegetables which were of direct benefit to humans. Foreign species were also incorporated into these early gardens and walls were built to protect family plots from animals and intruders. Over time, people looked to nature for ways to treat diseases and alleviate pain. The origins of plant-based medical treatments cannot be attributed to one specific civilization, but developed concurrently in cultures around the globe. Natural healing systems can be traced to the traditions of the Ayurvedic and Unani people of the Indian subcontinent, Chinese and Tibetan cultures in Asia, the Native Americans of North America, the Amazonians of South America and several local tribal systems within Africa. There is also evidence of medicinal plant recipes from Egyptian and Middle Eastern cultures. In fact, the oldest written evidence of the deliberate use of plants for medicinal purposes was written on Sumerian clay slabs found in area south of the Euphrates and Tigris rivers in modern-day Iraq. The artifact included formulas for various ailments using 250 plant species. The first recorded examples of formal gardens created for reasons other than subsistence, date back to the early civilizations of ancient Egypt, Mesopotamia, Persia and Asia. They began for a variety of reasons beyond basic food production. Pleasure, prestige, power and possibly even prehistoric instincts of our nomadic beginnings, made people yearn for wide-open spaces to experience and enjoy. Later, formal gardens were rooted in the divine and reflected the timeless quest for the meaning of life and our place within it. 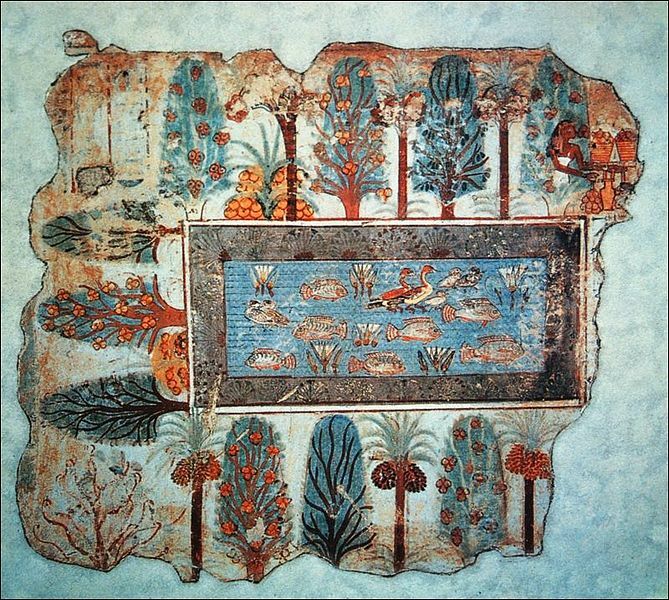 Gardens were essential to the lives of ancient Egyptians. They created neatly ordered green spaces filled with fruit, nut and ornamental trees as well as flowers, grape vines and papyrus. Gardens also had religious symbolism associated with specific gods such as Orisis, Nut, Isis and Hathor. There is evidence of elaborate cultivated grounds around tombs and temples to honor the deceased and provide them with natural spaces to enjoy in the afterlife. The imperial gardens of Mesopotamia were grand…even by modern-day standards. 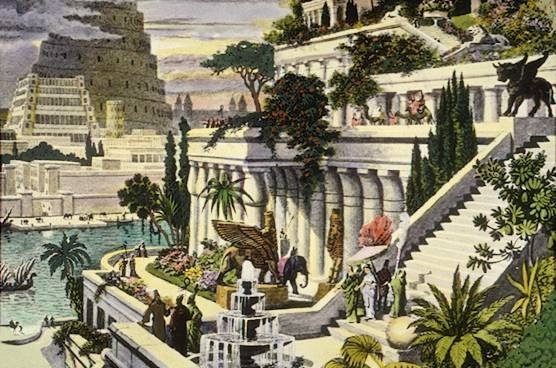 In fact, the fabled Hanging Gardens of Babylon were once considered one of the Seven Wonders of the World, although no archeological evidence remains to prove their existence or original location. The Assyrian garden differed from the symmetrical Egyptian garden, because they incorporated the natural terrain into their cultivated spaces. Assyrian kings brought back animal and plant species from foreign invasions and used their imperial gardens as evidence of their conquests and military might. Traditional Persian gardens may have originated as early as 4000 B.C. The Persians are known for the chahār bāgh style garden layout, (chahār meaning “four” and bāgh, “gardens”). The Persian garden was designed to emulate Eden, with four rivers and four quadrants that represent the world. Typical designs often feature water channels that run through each of the four quadrants and connect to a central pool. The idea of the garden as an expression of an earthly paradise (derived from the Old Persian word “paridaida”), spread through Persian culture during the Achaemenid Dynasty (550-330 B.C.). The Persians also influenced garden design in other cultures from Andalusia to India and beyond. The Taj Mahal is one of the largest Persian garden interpretations in the world, from the era of the Mughal Empire. The earliest Chinese gardens were created by emperors and aristocracy…and were designed to impress. These modified landscapes could be more accurately described as vast parks filled with select plant and animal species that were used for hunting and leisurely indulgences. Later, gentleman scholars, poets, government officials and merchants began to create more intimate spaces for personal reflection and escape from the outside world. Over time, the gardens and parks took on a sacred role and have been influenced by Hindu, Buddhist, Muslim, Daoist, Shinto and Modernist beliefs. A typical Chinese garden has enclosed walls, a water feature, rock formations, trees and flowers, all arranged in halls and pavilions connected by winding paths that lead visitors through a series of composed landscape scenes. These spaces are meant to evoke a feeling of being part of the natural world and reflect the traditional Chinese values of sensibility, self-confidence and harmony between man and the universe. The constantly changing scenery, altered by the effects of the seasons and changing light, is believed to promote philosophical inspiration and intellectual thinking. Japanese gardens were developed under the influences of their Chinese neighbors. However, the Japanese gradually began to create designs based on the unique terrain of their island archipelago and the Shinto religion. Their gardens first appeared on the island of Honshu, and were shaped by the distinct characteristics of the Honshu landscape with rugged volcanic peaks, narrow valleys, mountain streams with waterfalls and pebble beaches. Japanese garden styles serve many different purposes. 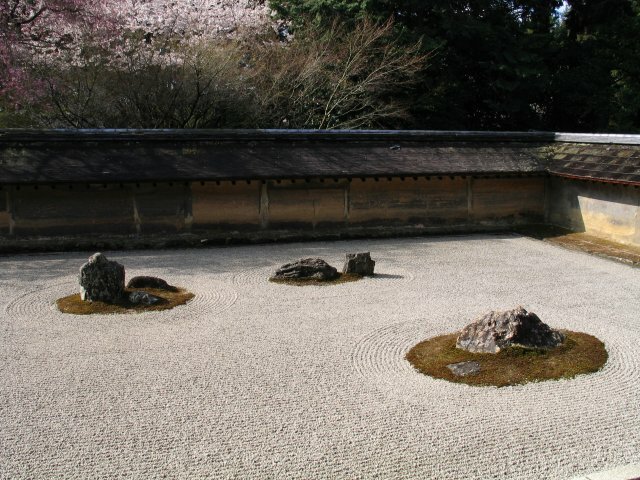 Zen gardens are designed to promote enlightenment through meditation and minimalist design leaves room for spiritual thinking. Roji are simple gardens with teahouses, where the Japanese tea ceremony is conducted. Promenade gardens feature carefully composed landscapes along a winding path. Throughout recorded history, the creation of gardens and cultivation of plants is universal to civilizations around the world. Although designs vary due to religious beliefs, cultural heritage, climate and landscape terrain, gardens and parks all share a basic unifying element. Experiencing the pleasures of nature make people feel better, both mentally and physically. The Roman Empire in the 3rd Century A.D.
Over time, societal structures became more organized and people began to categorize and cultivate useful plant species for their healthful and healing powers. As people ventured beyond their immediate environment, they began to share their knowledge with other cultures, thus ushering in a new era of international commerce and trade. The rise and fall of the Roman Empire had a great influence on horticulture. Romans were avid gardeners. From the grand landscapes of imperial country estates to the most humble private plots behind city houses, they treasured gardens both as places for relaxation and as plots to grow ornamental plants and trees, as well as fruits and vegetables. 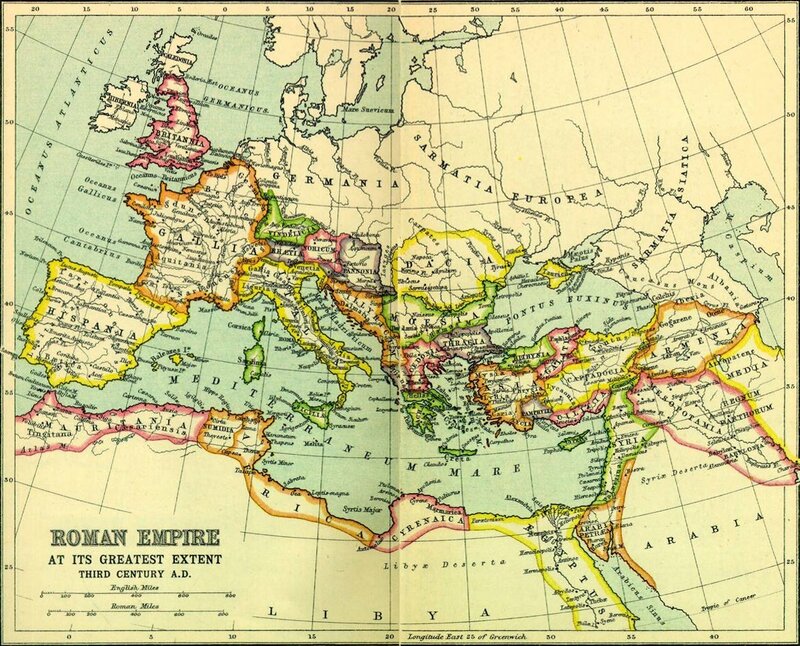 Like the ebb and flow of a great wave, as the Roman Empire expanded to include huge swaths of the Eurasian continent from Britain to North Africa and Portugal to Asia Minor, they flooded every corner of their newly conquered lands with gardens. Later, as their influence began to recede, they left behind the seeds of their horticultural practices that remained rooted in place long after they were gone. The Romans also influenced the monks. Foundation documents of numerous Christian monasteries, note that gardening was seen as an act of humility and also a necessary vocation. From a utilitarian standpoint, vegetable and herb gardens helped provide both nutritional and medicinal crops, that were used to feed or treat the monks and, in some cases, the outside community. These gardens became the model for the physic gardens (medicinal herb gardens) that would later appear in Italy and other areas of Europe during the 16th and 17th centuries. Another powerful wave swept the globe in the Middle Ages from the 5th to the 15th centuries. Marco Polo’s expeditions to Persia, China and Southeast Asia, along with the discovery of America in 1492 and Vasco De Gama’s journey to India in 1498, eventually led to the beginning of European overseas expansion and the rise of colonial empires. As a result, contact between the Old and New Worlds produced the Columbian Exchange: a wide transfer of plants, animals, foods, human populations and culture between the Eastern and Western hemispheres. At this point, the Age of Discovery enveloped the world, and with it, the rise of international trade. 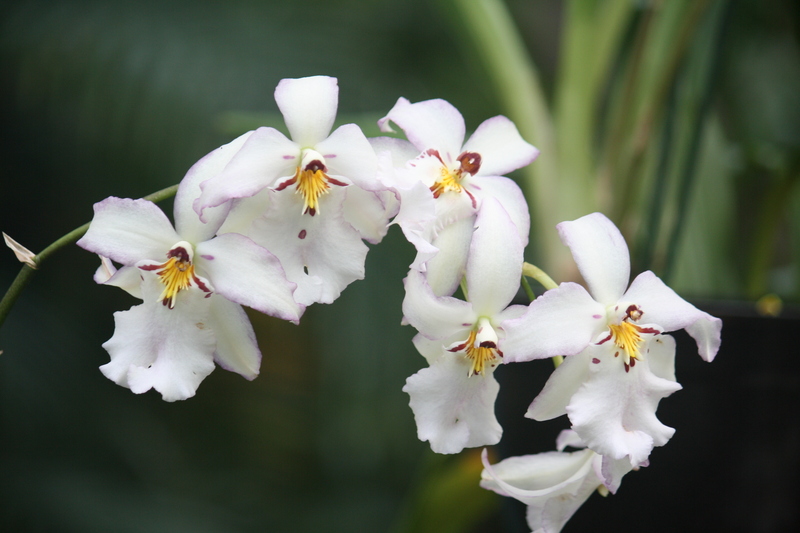 Organizations such as the Royal Botanic Gardens, Kew and the Real Jardín Botánico de Madrid were set up to try and cultivate new species that were being brought back from expeditions to tropical locations. They also helped found gardens in tropical regions to cultivate newly discovered plant species for commercial use. These distant tropical plantations were created almost solely to receive and cultivate commercial crops such as cloves, tea, coffee, breadfruit, cinchona, palm oil and chocolate. As trade routes expanded and new lands were being surveyed, botanists and naturalists were commissioned to accompany these expeditions and document the flora and fauna along the way. 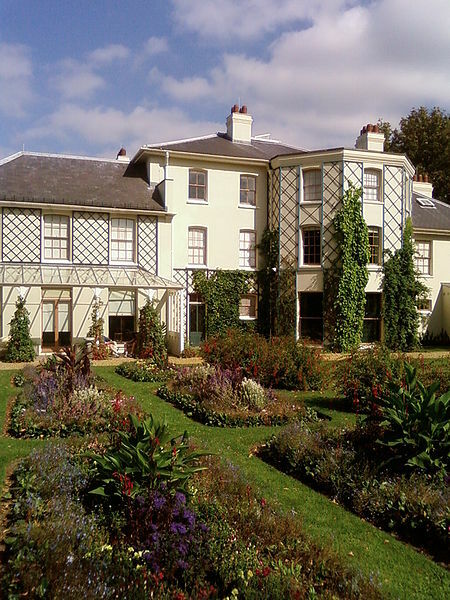 By some twist of fate, Charles Darwin, a seemingly ordinary young man encouraged by his father to become a country parson, instead accepted a commission (without pay) as a naturalist aboard the H.M.S. Beagle, a scientific ship assigned by the British Admiralty to survey the east and west coasts of South America. As the Beagle cast off from the shores of England, no one could have predicted the ripple effect that would be created by this monumental journey…washing away traditional beliefs of divine providence and the immutability (unchanging nature) of species and replacing it with new findings that would uproot the scientific community worldwide. Darwin spent the next five years on a voyage around the world, collecting natural specimens, including birds, plants and fossils. He had the rare opportunity to study the principles of botany, zoology and geology through a wide-angle lens. The varied nature of ecological systems from South America and the Galapagos archipelago to the Pacific Islands, gave Darwin unique insights into nature itself. He began to see patterns of adaptation that countered established creationist theories. Upon his return to England, he fine-tuned and double-checked his theories through detailed experiments, anticipating a strong backlash from the church. With much trepidation, Charles Darwin published On the Origin of Species by Natural Selection in 1859, and created a tidal wave of controversy between science and religion that remains to this day. Darwin has been described as one of the most influential figures in human history. Why? Because he discovered nature’s golden rule…in order to thrive, we must adapt and live as part of our environment, not apart from it. Scientific research has come a long way since the days of Darwin. And yet, we still resist basic ecological principles that ensure our continued health and wellbeing as a species. We are more knowledgeable and connected than any other time in human history. Information and ideas circle the globe at the speed of thought. Food, medicine and other plant-based products are imported and exported in a complex network of international trade. However, even knowing what we do, the earth’s natural resources have been exploited with little thought given to the consequences of our actions. As a result, a new wave of change is looming on the horizon. Climate change…and this time nature is at the helm. Today, the nature of gardening is returning to its roots. Environmental education programs are now being offered in schools, parks and botanical gardens around the world. Innovators are building rooftop greenhouses and retrofitting high-rise buildings with vertical gardens and green spaces. Urban gardens are replacing blighted neighborhoods and there is renewed interest in the family farm. According to the World Health Organization, currently, about 80% of the world’s population relies on plants for their primary health care and some 35,000 to 70,000 species have been used as medicines. 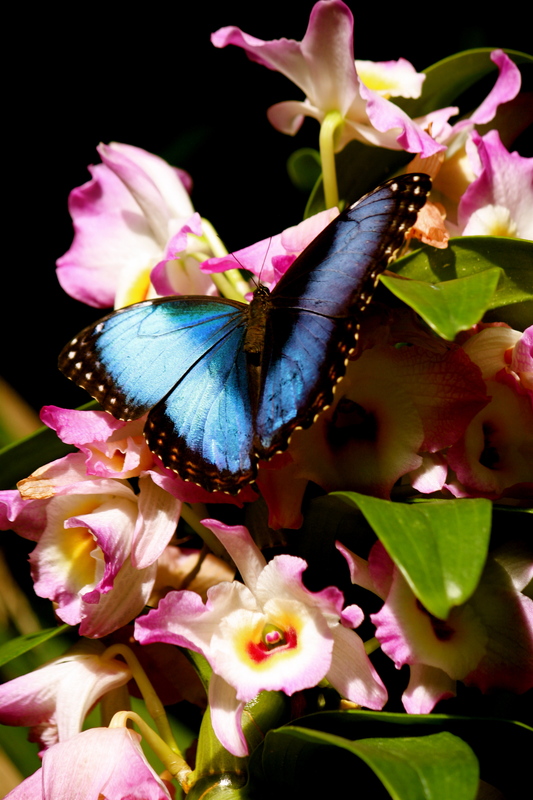 In today’s global pharmaceutical market, more than 50 major drugs originate from tropical plants. There is also an increasing amount of evidence that humans derive direct psychological benefit from exposure to nature. In retrospect, this should come as no surprise. Time spent in the garden reaffirms the fact that our body, mind and spirit are deeply rooted in the natural world, regardless of how complex our lives may become on the surface.